Smartphones and tablets have become the norm in the way we communicate. From banking to social media, consumers expect everything to be mobile-integrated. This mobile inundation has moved beyond the consumer space to the workplace. Employees are accessing their work remotely via mobile, allowing them to work anywhere at any time. 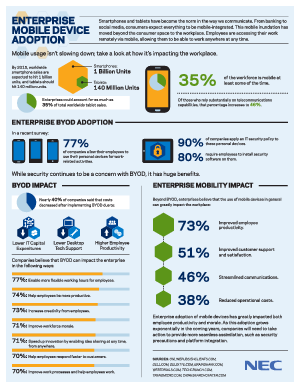 To learn more about Enterprise mobile device adoption download this whitepaper. Compliments of NEC.